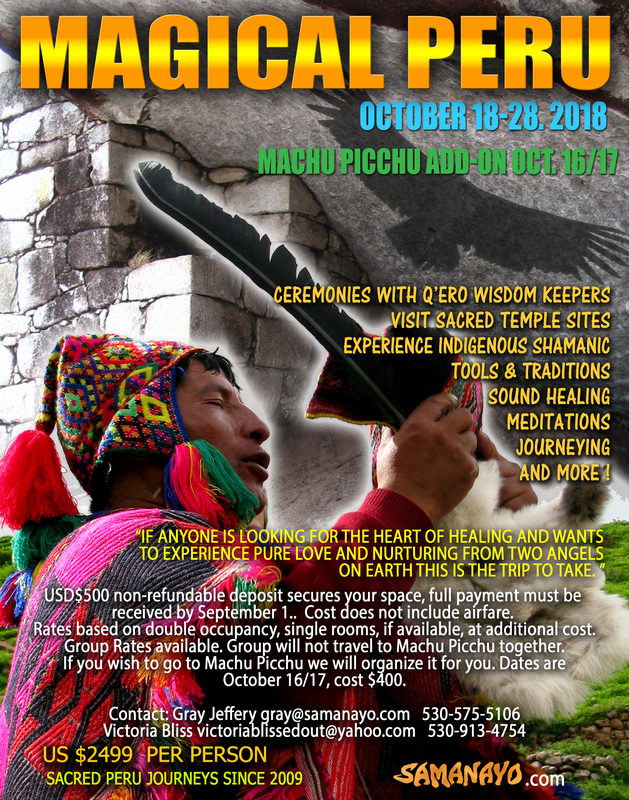 We will lead a ten day spiritual journey into Cusco's Sacred Valley, to visit sacred Incan sites, be in ceremony with the Q'ero shamans and experience their traditions. On this journey we will be staying in the sweet little pueblo of Pisac in the Sacred Valley and make daily excursions via a private van. Daily activities include meditation, movement, journeys, sound healing, despachos, and other ceremonies with the Q'ero shamans and direct experience in the powerful energy of the Sacred Valley. We pride ourselves on creating and holding safe, sacred space and also believe in having fun on these journeys. The energy of the Sacred Valley is transformational. When we allow ourselves to simply be in its' beauty and power we open to discovery and possibility. 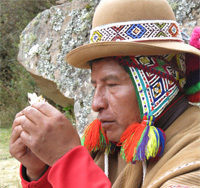 The focus of this journey is to work with the Q'ero shamans of the high Andes. Their medicine is Pachamama, our earth Mother, and the Apus, the spirits of the mountains. The focus is NOT plant medicine, however, we may offer an optional San Pedro ceremony for those interested. We have been leading journeys to Peru since 2009. Previous attendees have had powerful experiences. Please see the Testimony page for comments. For a photo slideshow of our Yoga Peru 2014 click here or Magical Peru journey October 2013 click here. Cost: per person $2525. US$500 non-refundable deposit secures your spot. Full payment must be received by September 1, 2018. Group rates available. Maximum 12 people for this trip. Although these journeys are not arduous, it is good to be in decent physical condition. We recommenbd arriving in Cusco at least a day or two in advance of the retreat so as to acclimate to the altitude. We will not be going to Machu Picchu as a group. 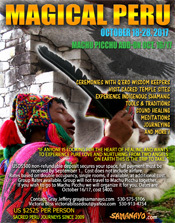 If you wish to go to Machu Picchu we can organize it for you and the dates will be October 16/17, just before our group begins. The cost is $400. Please contact us for more details. • Hotel accommodations based on double occupancy. Single rooms, if available, at additional cost. • Group transfers by private bus or taxi, if applicable. If you must cancel your journey for any unforeseen circumstances, your deposit is non-refundable. No refunds will be given for unused accommodations or services. We recommend purchasing travel insurance in order to protect yourself in case extenuating circumstances force you to cancel your trip. I love you both so much! " Basilio is a dear Q'ero paqo that we work with quite regularly. Here is a brief video of him in 2013 calling in the Sacred Apus (the Spirits of the mountains) before beginning a ceremony. Click on the picture to view.